DekTec Matrix API framework takes care of all the plumbing for creating robust real-time SDI processing applications. Organizes incoming HD-SDI data in a matrix of frame buffers, so that frames can be accessed as a function of port number and time. Synchronization of multiple input streams is straightforward: Frames with the same arrival time are stored in the same column. Read or write to individual lines, HANC, VANC or full frame. Access functions for embedding or de-embedding audio or other ANC data. Integrated and fully compatible with DTAPI. 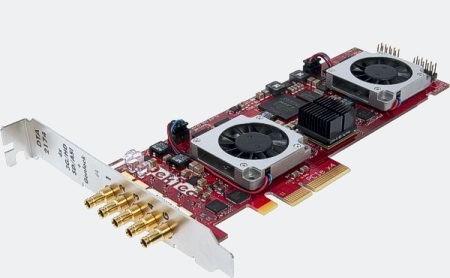 DTA-2174-SLP – Quad 3G-SDI/ASI input/output for PCIe with StreamXpert Lite and StreamXpress player software. DTA-2174-SXP – Quad 3G-SDI/ASI input/output for PCIe with StreamXpert 2.0 stream analyzer and StreamXpress player. 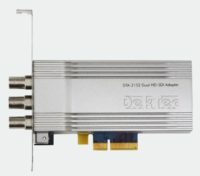 DTA-2174-SY-SXP – Quad 3G-SDI/ASI input/output for PCIe with SdEye and StreamXpert 2.0 stream analyzer and StreamXpress player. DTA-2174-VR-SY-SXP – Quad 3G-SDI/ASI input/output for PCIe with VF-Rec stream recorder, SdEye and StreamXpert 2.0 stream analyzer and StreamXpress player.